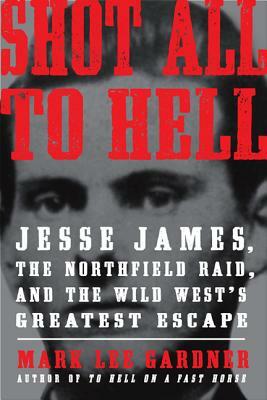 Shot All to Hell by Mark Lee Gardner recounts the thrilling life of Jesse James, Frank James, the Younger brothers, and the most famous bank robbery of all time. Follow the Wild West’s most celebrated gang of outlaws as they step inside Northfield’s First National Bank and back out on the streets to square off with heroic citizens who risked their lives to defend justice in Minnesota. With compelling details that chronicle the two-week chase that followed—the near misses, the fateful mistakes, and the bloody final shootout on the Watonwan River, Shot All to Hell is a galloping true tale of frontier justice from the author of To Hell on a Fast Horse: The Untold Story of Billy the Kid and Pat Garrett, Mark Lee Gardner. Mark Lee Gardner is the author of To Hell on a Fast Horse and Shot All to Hell, which received multiple awards, including a Spur Award from Western Writers of America. An authority on the American West, Gardner has appeared on PBS’s American Experience, as well as on the History Channel, the Travel Channel, and on NPR. He has written for the Los Angeles Times, True West, Wild West, American Cowboy, and New Mexico Magazine. He lives with his family in Cascade, Colorado. “Superb. ... Mr. Gardner earns an A+ for his research and an A++ for his writing.